So The Boss is in conversation with several of his CEO pals and the issue of a company’s organization and how to grow the organization in the face of several competing thoughts has bubbled to the surface. Few folks think of organization as being a critical management driver of a business. But it can be a critical driver of long term success. Let’s discuss how. 1. Growing the organization to support the fundamental scale up of the business. That’s why they are in business, right? Growth, hypergrowth — bring it on, says the CEO. This growth could be operational or marketing or financial — anything on the org chart which needs a bit of expansion or thoughtful design in order to achieve the vision of the CEO. 2. Growing the organization — particularly sales — to drive the scale up of the business. This is an altogether different topic than just the organization of a business itself. We can muse about this in another blog post. 3. The necessity to approach growth in a startup or small business with a weather eye toward “crawl, walk, run”; the necessity to grow in a controlled and gradual manner; and, the necessity to be thoughtful as it relates to cost. 4. The wisdom of keeping the organization lean, agile and nimble. The CEOing business is a series of challenges and tends toward optimization rather than maximization. There are good, better, best solutions but each seems like a completely new discovery based on changing circumstances. Do not be discouraged. It is not easy. CEOs have to think these things through and make wise decisions at an instant in time and look to neither impede growth by being slow to decide and implement change as well as not overrunning their coverage and growing too fast. Tough stuff but this is why they get paid the big bucks, right? The simple answer is YES and the complex answer is: organization can be a critical element in the success of a young company which is forced to — wants to really — grow in a lean, agile and nimble manner. For a great example that does not pick a particular industry as a focus, let’s look at George Washington, America’s best crisis leader and manager some would say. WTF, Big Red Car? George Washington? Huh? Yes, Grasshopper, that George Washington. He was an organizational genius really. Read on, dear friend. The Big Red Car will tell you a pretty good story. George Washington and the Continental Army had a very difficult Q4-1776. You can identify with a bad quarter, right? The dashboard was looking a bit bleak. The Americans had put a pretty good lick on the British at Bunker Hill (Breed’s Hill, Bunker Hill all the same battle) back in 1775 leaving almost 1,200 of the world’s best soldiers dead and dying and bleeding on a hillside that the Americans then gave to them for “free” and lived to fight another day. The Americans faced a shortage of ammunition and retired from the fray having suffered about 450 casualties themselves but most importantly had signaled that they could fight and win v the truly scary British professional Army. A very hefty — the largest single day British casualties of the entire Revolution — price that would impact British strategy for some considerable time. Those Colonials could really shoot straight and when they were prone behind fortications and picking off the Redcoats they aimed first at the British officers. Officer casualties were very, very high. The Redcoats were not that hard to spot. Look at this picture. Could you see one of these guys coming uphill and waiting until you saw the “whites of their eyes” and putting a bullet – dead center mass? The British — in Q4-1776 — had come back to America to avenge Bunker Hill and had landed on Long Island. They brought about two thirds of their Army and half of their Navy. The best in the world and currently undefeated on several different Continents. Pretty arrogant bunch. The British were angry and spoiling for a re-match. They brought another 30,000 Hessian/German mercenaries. If the Brits were good, the Hessians were the New York Yankees. The British and their Hessian/German mercenaries had kicked the Continental Army across Long Island, Manhattan, Harlem, northern New Jersey and across the Delaware River. I said it was a very bad quarter, right? George Washington was faced with a very difficult situation as his army had not actually prevailed in a single battle in Q4-1776 and had sustained meaningful losses of men and materiel. Interestingly enough, Colonial morale was still high. They still believed in their cause. They were hunkered down across the Delaware River licking their wounds and getting ready for the inevitable Spring offensive. The Continental Army had been built from the marshaling of many state militias who had enlisted for one year as part of the original assembly process. That one year was coming to an end, so Washington’s first problem was maintaining the manpower of his army. Sound familiar? Recruitment, retention — ever struggled with that yourself? Washington, having weathered the recruitment storm, began to face the issue of how to organize such a disparate set of units into some semblance of order that could fight and win against the larger British and Hessian forces. Cutting to the chase — he made the decision to organize around brigades rather than regiments. The smaller brigades concentrated the leadership — more officers and sergeants leading a bit fewer riflemen. He also maintained complete unit integrity with state militias raising additional formations rather than combining different state militias into larger formations. The Continentals, because of their lean, agile and nimble organizations, could create bigger “task forces” by simply pooling brigades and appointing leadership above them. The fundamental fighting unit — the brigade — did not change. The task force approach simply created a bigger striking force and when combined with artillery became one of the first combined arms military organizations in then modern warfare. A concept which has been a tenet of American military thinking in every war since the Revolution and is the greatest strength of our modern Army — the use of combined arms — infantry, armor, artillery, air, sea power used in concert. These were fundamental discreet organizational decisions that ended up making a huge difference in the long run. This was George Washington’s design of his organization. DESIGN. In addition, Washington allowed the state militias to organize and elect their own officers. Promoting from within in today’s business parlance. In this manner, the best leaders could bubble to the top. Some units elected unlikely leaders — men who had however established their leadership prowess in actual battle. Accomplished combat leaders for combat units. In a brigade sized unit, the aggressiveness and competence of leaders could easily trickle down to the individual rifleman. Some American units were fiercesome because their leadership was fiercesome. While Washington was employing basic organizational design, the British and the Hessians were actually compromising their own organizational integrity by their own design. 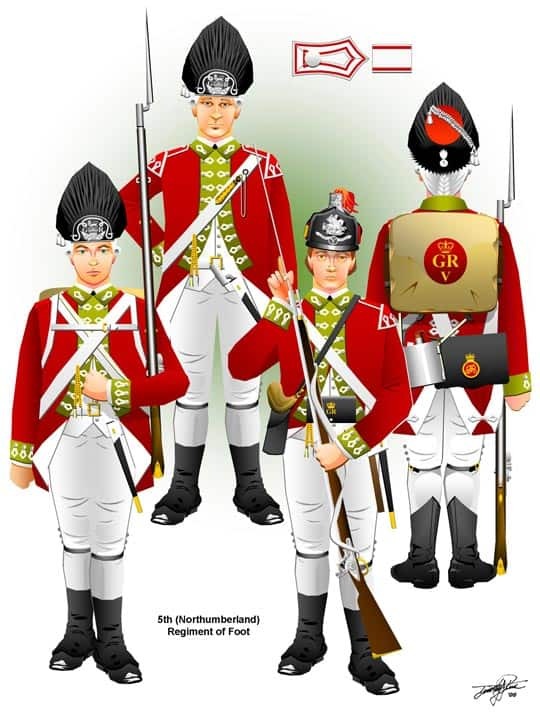 The Brits and Hessians used very large formations based on regiments in the nature of the Prussian Army. This created unwieldly units and when their leadership was decimated by the straight shooting Colonials this left many of these units lacking adequate leadership at moments of decisive engagement. It was very hard for the British and Hessians to replace good combat leaders when 3,500 miles from home. Nonetheless, these units started the Revolution with superior leaders — superior to the Colonials from a macro perspective. But attrition soon was felt. The British and Hessians also would take their larger units and strip out the Grenadiers and Light Infantry — the modern day equivalent of Rangers and Paratroopers, elite units — and combine them into single larger units. While this made a powerful and specialized unit, they immediately lost combat power in the remaining straight leg Infantry units that were left behind. They had stripped these units of their best soldiers and leaders. The newly constructed units did not have the same esprit de corps of their home units. This was a bad organizational initiative. It was a bad decision in the face of a good decision by Washington. The Americans also did wonderful things in the organization of their homegrown artillery units and were able to create particularly skillful artillery units which were then attached to single purpose task forces and thereby injected a very high level of expertise at the point of the spear. Some American artillery units were so nimble and agile that they could be used in the assault as powerful assault weapons — something the British were unable to master during the entire Revolution. A very young Alexander Hamilton of the New York Artillery rose to fame because of the expertise of his gunners and how they figured in critical battles. When organizing for war or business, the nature of your organization matters. You have to design it to fight and win every day. You have to DESIGN it for the challenges you face. Did I mention you had to DESIGN it. It does not happen by accident. Do you add an accountant or a data entry person? Do you add an additional software engineer or do you use freelance or outsourced talent? Do you have a useful correlation between the cost of your overhead v your revenue? Do you add another salesperson or a marketing manager? Do you stretch the span of control or do you create more hierarchy? Can you use part time or intern talent? Are you being anticipatory, proactive or reactive as it relates to organization structure? The biggest question is really this — are you spending time thinking and musing about how your organization grows to support the growth of the business? Are you designing your organization to fight and win? There are no “one size fits all” solutions nor are there any real exemplars that are universally applicable. What there is is a continuing challenge that you will have to meet to be successful. You are George Washington in Q4-1776, go design that winning organization. Fight. Win. Win. Win. Umm, The Boss says I have to apologize to all of our British readers. Sorry, ya’ll. Didn’t mean to get personal. This entry was posted in Business, Company owner, Crisis management, Entrepreneurship, Organization, winning and tagged design organization, organization, win. Bookmark the permalink. Yup. Scaling-up is not easy but requires foresight and courage, in business and war. There are no cookie cutter approaches. Enjoyable read, BRC. You’re on a roll. George would have been amused with your Yankees analogy. In fact, both Georges shared an unyielding commitment to their mission.